The Swiss Sovereign Money Initiative, or «Vollgeld-Initiative» will launch a big campaigning tour in 2017 – in over 30 cities during the entire summer. Our mascot will be a gigantic 6 meter high and inflatable piggybank. We want to make the concerns of the «Vollgeld-Initiative» more easily understandable for the broad public: the electronic money on our bank accounts will become as safe and secure as the notes and coins found in our piggybanks. We need to talk about (our) money! Our Campaign will raise the profile of the «Vollgeld-Initiative» in politics, in the media and most of all with the voters. A vast majority of the Swiss people – over 75% – still have no clue how our monetary system actually works. This has to change! The Vollgeld-Initiative introduces a democratic monetary system that effectively prevents further financial crises. The tour will bring the Initiative to people’s attention and trigger a stronger public debate. 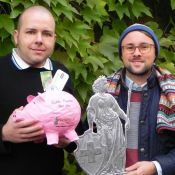 To do this we’ll create a gigantic inflatable piggybank, which has «Echte Franken für alle» («Real or genuine money for everybody») as well as the Vollgeld-logo written on it. This will be accompanied by an info-booth with leaflets and manned by an expert to answer people’s questions. Please support this huge opportunity to tackle the fundamental problem we currently have with our monetary system. With the adoption of the «Vollgeld-Initiative» Switzerland would be the first country with completely safe money. Further financial crises would no longer be possible. Imagine what an impact this change could trigger in the rest of the world: Banks could no longer create money themselves, but only democratic and sovereign central banks would allowed to do so. With your help we can make people in Switzerland aware of the sad state of today’s monetary system and show them that they actually have the opportunity to change this once and for all. Since day one the Vollgeld-Initiative was started by and has since been supported by concerned citizens. The collection of signatures was only possible because of an outstanding voluntary commitment. That’s how we, as a small civil movement, collected over a 110’000 signatures from Swiss citizens – without any support from political parties or other NGOs. This first milestone of Vollgeld-Initiative was only made possible by our heavily committed and relentlessly working campaigning team. We – Simon and Matthias – are part of this team. Although we come from completely different backgrounds – Matthias is a truck driver and Simon is an economist – we yet work together for the same purpose. We want Switzerland to be the first country to have a completely safe and stable money system. Our money shall no longer be the plaything of banking speculation and neither shall we be forced into recurrent financial crises. Our politicians and parties still don’t dare to embrace our Initiative and try to avoid debating it. Frankly: We’re not going to accept that. The Vollgeld-Initiative is capable of winning a majority if only people knew about the problems with our money. Therefore we’re now taking the public debate into our own hands to bring the Vollgeld-Initiative to the people. A Campaigning tour throughout the entire summer needs extensive funding as well as human resource. For a professional tour we need 25’000 CHF in total. This project ended successfully on 3/12/2016 12:00! Sponsorship: Thanks for your sponsorship. We will be updating you during the tour and send you e-mails with pictures and news. Vollgeld Coffee Set: You will recieve a coffee cup bearing our Helvetia Logo as well as a Saucer bearing a 2 Franc coin. 10 Franks of Vollgeld: You will recieve a real 10 Francsnote with a «Vollgeld»-slogan pressed in leaf gold. «Das nächste Geld » – the new book by Chr. Pfluger. However only available in german. Vollgeld-Aperetif: With the completion of Vollgeld on Tour we will be inviting you to a aperetif and looking back at how the tour happened, share some funny stories and serve you nice food. Journey and arrival is not included. 20 Franks of Vollgeld: You will recieve a real 20 Francsnote with our «Vollgeld»-slogan pressed in leaf gold. Helvetia T-Shirt: You will recieve a special edition t-shirt printed with a golden Helvetia. Swissness all the way! «Vollgeld»-Portemonnaie: We will send you a special wallet with our «Vollgeld» slogan stamped in the leather. At least in german it’s very cheek in tongue, as it gives a nice double entendre. Bring the Vollgeld on Tour to your city. Well that one is only for the Swiss people, since we will exclusively be touring around Switzerland. Federal Constitution with Vollgeld-Article: We are assured that Vollgeld-Initiative will be adopted. Therefore we print some advance copies of the new federal constitution of Switzerland including the constitutional articels of Vollgeld-Initiative – cased in beautiful gilt edge and red leather. Paintings from the Vollgeld-catalogue: You may choose one out of the 8 pictures from the 1000 CHF category. Have a look at the respective slideshow and/or our detailed catalogue. We will continuously update the pictures still available in our linked catalogue below. Paintings from the Vollgeld-catalogue: You may choose one out of the 10 pictures from the 1500 CHF category. Have a look at the respective slideshow and/or our detailed catalogue. We will continuously update the pictures still available in our linked catalogue below. Paintings from the Vollgeld-catalogue: You may choose one out of the 14 pictures from the 2000 CHF category. Have a look at the respective slideshow and/or our detailed catalogue. We will continuously update the pictures still available in our linked catalogue below. Paintings from the Vollgeld-catalogue: You may choose one out of the 25 pictures from the above 2000 CHF category. Have a look at the respective slideshow and/or our detailed catalogue. We will continuously update the pictures still available in our linked catalogue below. Please note that the pictures in this category have different prices and need special attention. We are Simon, Matthias and Helvetia – all part of Vollgeld-Initiative since day one. After 18 months and thousands of collected signatures later, we collectively have achieved the first sensation: Over 110’000 signatures for Vollgeld-Initiative. And now it’s time to bring Vollgeld-Initiative to the broad public!